This listing of top five best beach hotels in South Beach shows just what a unique and exciting venue this area of Miami can be, as well as why the area has been one of America's top beach resort destinations since the early 20th century. 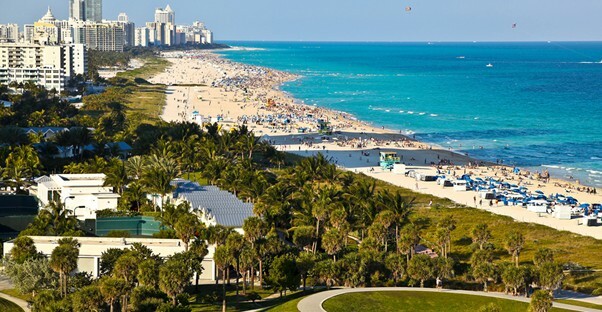 The South Beach neighborhood, located just across Biscayne Bay in Miami Beach, has marvelously sunny beaches in the day with nights full of a festive buzz and energy. With that in mind, these are five top locations in South Beach that will not disappoint. They are located directly on the beach and are consistently rated high for top service to make sure every guest's stay is comfortable and world-class. The place lights up the South Beach scene at night with vivid neon pastels. The rooftop terrace suites provide fabulous day and night views of the ocean. The suites are splendid with tile and dark wood themes. There are spacious common areas, restaurants, and bars on-site. The energy of the South Beach nightlife fills the lower levels in the evenings. Located near the Art Deco district, the location is ideal for business or relaxation. Amenities include a bar/lounge, beach access, fitness center, kitchenettes, room service suites, and swimming pool. In the heart of South Beach's energetic nightlife, this is a small boutique hotel with a fabulous pool, restaurants, and lounges on-site. With private beach access, the Delano offers comfortable rooms and remarkable beds. The location is perfect for soaking up sun at the beach and for strolling into the nightlife scene, complete with clubs, music, dining, and dancing. Amenities include fitness room, spa, room service, and shuttle bus service. This hotel gives the full feeling of luxury at the beach. It has a magnificent outdoor pool, and many outdoor lounge areas. Walk onto the beach for a day of sun and ocean breezes. There are restaurants on-site and room service. Night or day, the feeling of the water fills the air and the spacious outdoor areas invite pauses for relaxation. The furnishings are a global mix of styles, colors, and fabrics. Amenities include spa, outdoor pool, exercise room, room service, and shuttle service. The facade of the Betsy has the look of a mansion along the French Riviera, pearly white with colonnades. The well-appointed interiors are at home in the famous Art Deco district. It is located near the Art Deco district's reception center, and many of the famous club locations on Ocean Boulevard. The rooms are spacious and light with city or ocean views. It has a rooftop terrace for sun and evening breezes. Amenities include designer toiletries, restaurant, two bars, outdoor pool, spa, and fitness rooms. The SLS has beach access and a large pool area for relaxation. The style is Art Deco, and it is located within one mile of the Art Deco district, a shopping mall, and a short distance from the Gleason Theater. The Airport is 20 minutes away by car. There are three nightlife venues on the property, as well as Spanish-themed and sushi restaurants on-site. The energy of South Beach fills the common areas and entertainment venues nightly with music and dancing. Amenities include an outdoor pool, exercise room, spa, restaurants, full bath, bars, and an iPad available in each room.